During winter in Glacier, the snow caps dazzle on the mountains, the forest sits still and peaceful, and a blanket of snow muffles the bustle of civilization. There’s no better time to relax, reflect on the past year, and make plans for times still to come. Picking a favorite season in Glacier National Park is like playing favorites with your children—they’re each unique and wonderful in their own special way. But if we had to choose…well, we can’t say for sure that winter would top the list, but it would certainly put in a valiant fight. Winter comes at a different time each year. Sometimes first snowfall waits until the calendar is ready for winter, and other years the end of August welcomes the wintery white blanket on the hillsides. Fortunately, Glacier National Park is open ALL year round and offers an abundance of activities regardless of the time of year. We whittled down the list to give just five things to get you out there and experiencing the beauty of snow season. Snowshoeing – a traditional way to cross snow-covered terrain, snowshoeing is suitable for all the family and allows you to experience the extraordinary silence of the park in wintertime. Take a ranger-led snowshoe to uncover all the behind the scenes activity of wildlife during snow season. Nordic Skiing – A great way to get a full-body workout along with a lungful of that clear mountain air! A popular place to ski in the park is the Camas Road, but depending on your level of experience and yearning for adventure, there are unlimited options for you to choose from. Photography – Winter brings the contrast that gives aspiring nature photographers the perfect shot. The added bonus is that you get to experience the landscapes in 3D for new inspiration and perspective. Sightseeing – The Going-to-the-Sun Road is typically plowed up to the Avalanche Creek pullout, enabling visitors of all ages and physical conditions to travel through breathtaking scenery along the shores of Lake McDonald with views of the glittering peaks that lie beyond. 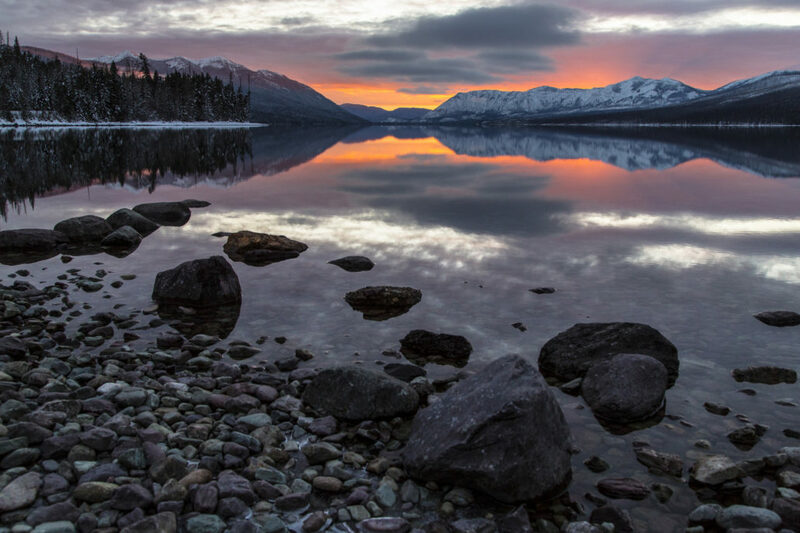 Beachcombers can explore the shoreline at Apgar and at Lake McDonald Lodge, and there are plenty of places for visitors to bundle up and reflect on the views. Wildlife spotting – while the bears may hibernate, there are plenty of winter residents to be found such as snowshoe hare, deer, chipmunks, and eagles. But the fun doesn’t stop there. Flathead National Forest offers up miles of pristine wilderness as well, with outfitters throughout the region at the ready to help shape lasting memories. Here are our five favorite things to do just outside the national park boundaries when the weather turns chilly. Dog Sledding – See the landscape in a new way behind a team of bounding canines. This unique experience will leave a lasting impression: from hanging out with the dogs as the sled is prepped to the steaming cup of cocoa afterwards, you won’t want the day to end. Snowmobiling – Feel the rush of adrenaline as you power through the winter wonderland on the back of a snowmobile. Top-notch guides give you everything you need to have fun behind the handlebars. Downhill Skiing – World-class skiing just 30 minutes away at Whitefish Mountain Resort and 75 minutes to Blacktail Mountain draws people from all over the globe to hit powder day hard. Join in the fun and explore off the beaten track on performance rentals or sign up for a beginners course to get your skis under you. Ice Fishing – Drop a line through the ice and see what the day’s catch holds for you in a trip to take advantage of the winter’s hard freeze. Sleigh Rides – Snowy fields mean it’s lovely weather for a sleigh ride together! As close by as Whitefish, winter visitors can find coursers ready to lead the charge as sleigh bells jingle. Bundle up and enjoy the bite of chilly air as you fly over the landscape. When you are all done adventuring, choose your favorite toddy from the bar and curl up beside a roaring fire in the lodge. We have all you might need for a relaxing break far from hustle and bustle. Click here to book your winter getaway and get ready for a snowy wilderness adventure!